When it comes to online gambling, having a good knowledge of the casino you are going to be playing on can literally be the difference between getting conned and having a great experience. To start off on this EUcasino review, let’s take a look at its background. 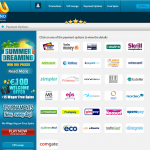 The website is owned by SkillOnNet Limited a Malta based casino software provider. 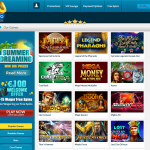 The parent company is widely known for its customizable online casino platforms and an extensive range of games even featuring over 500 titles held by Microgaming engines. 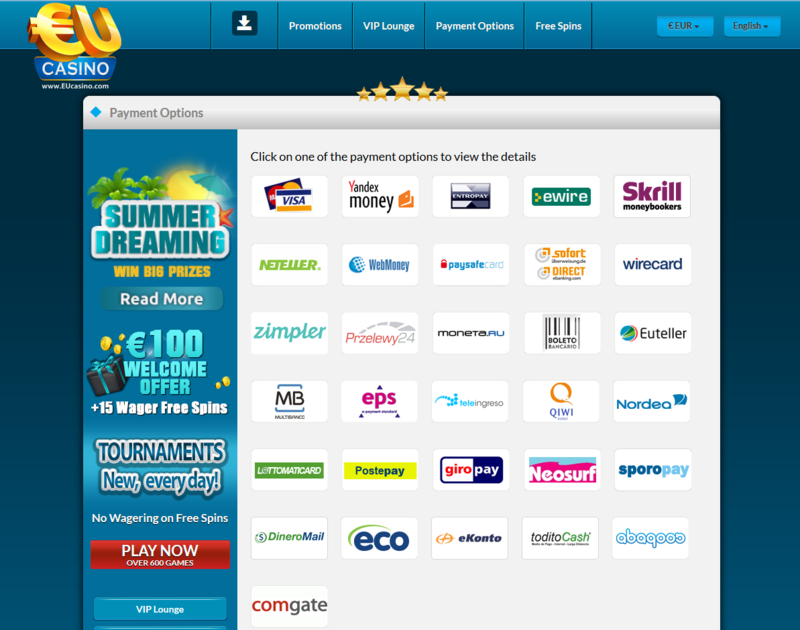 EUcasino currently has over 600 games ranging from card games to roulette games. 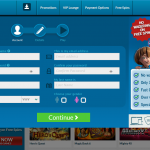 This gives players the chance to even out their winning odds on different games all while playing on the same platform. This also comes in highly recommended for anyone who is new to the world of online casinos. To reduce chances of early losses due to lack of experience, the company provides a free non-money version in the free money mode. This basically allows new players to adapt to the casino’s functions while introducing them to online gambling. Of course, the feature is limited, and you will be have to start making cash deposits in order to enjoy the real deal. 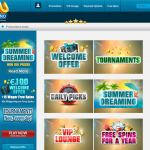 Later on, in this EUcasino review, we will mention how the deposits can still be maximized through bonuses. The website current permits deposits from either VISA, Yandex Money, EntroPay, Neteller, Webmoney, Paysafecard, Zimpler, postepay, eco, giropay, comgate, dineroMail, and Skrill. Of cause, all payments are done real-time and will reflect in your in-game account balance as soon as the confirmation is received. When it comes to withdrawals users are permitted to make them through e-wallets, Skrill and Neteller. The maximum withdrawable per month is €10,000 with a minimum of €5,000 per transaction. The casino currently has over 600 available games with major categories being card games, video and regular slots, video poker, roulette and other generic games. Currently, the most acknowledged titles are mega fortune, wonder woman, mega moolah, millionaire genie and even Terminator 2 (online slot). 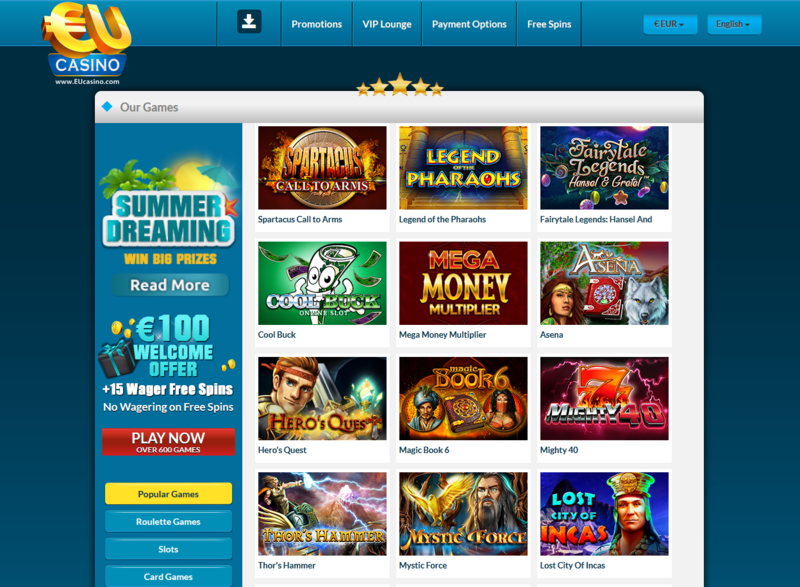 It’s important to note that each of these categories contains hundreds of games which are only available on EUcasino making it a popular watering hole for both amateurs and legends in online gambling. With such a wide variety players, will have a wide selection to select from and also increase their winnings through different plays. The game engine is also well optimized to give players the best gaming experience while still maintain quality winning ratios and additional bonuses as we will see later on in this EUcasino review. To ensure optimum performance and ease of access the casino is currently available in both downloadable packages as well as the web version. Of cause, both run on real-time connectivity. The desktop client courtesy of SkillOnNet will allow you to quickly access the gaming modules without having to go through the website loading process making it even faster. Another advantage of it is the access to live casino where players can take part via webcam and with live professional dealers. Some of the available games that support this mode include blackjack, baccarat, and roulette. The game engine runs on 128 bit SSL encryption technology ensuring that the online privacy of its subscribers is well maintained. In addition to this majority of the games are ran by Random Number Generator ensuring all outcomes are unbiased both to the player and the casino. 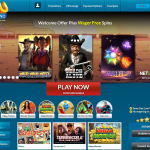 After signing up for an account, you will receive ten free spins which can accumulate to up to 150 spins for the first three hundred and fifty dollars’ deposit. The site also offers different daily promotions each with varying amounts of bonuses. These go a long way into ensuring that the everyday player never runs out of cash to play with. Bonuses from deposits which are only to be used to a maximum of 10% on a single wager. Welcome package, this is in connection with the 2nd, 3rd, 4th, and 6th deposit. To receive a “refer your friend” bonus, the referer must deposit cash into their account within a week. The VIP lounge is earned through cumulative points from each gem played; this offers lucrative deals in cashback offers, free bonuses and exclusive events invite. To ensure that all cases are processed on time, the company has invested in a 24/7 support via phone. The email and live chat support also work hand in hand with the call support to allow easier management of complaints in such a way that the customer does not end up suffering. Currently, the help center deals with English only, but there are plans of extending this to other international language as the website’s popularity continues to grow. Furthermore, the company deals with cash reversals amicably and without the usual delays that we see in major online gambling sites. In the case of errors during such a transaction the help care team will get in touch with you through your account’s email address. 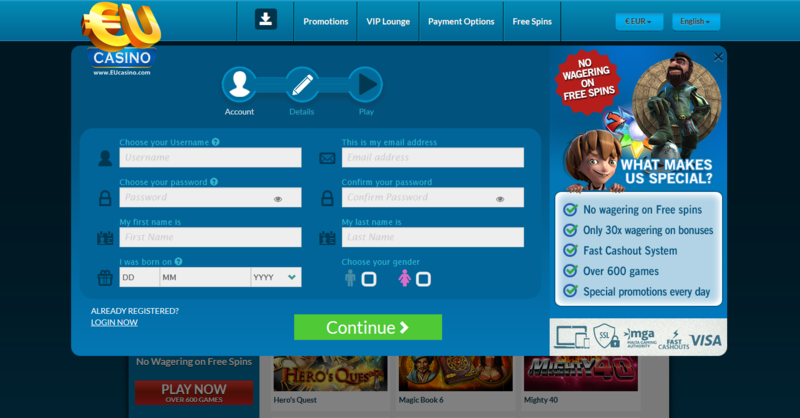 The online casino industry has seen some significant changes, mostly when it comes to providing playing options. 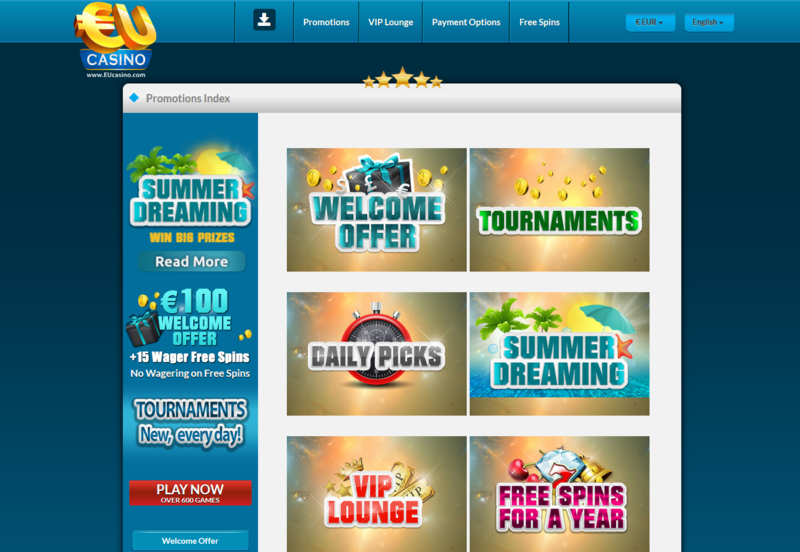 EUcasino has been on a leading path in this growth and promises a lot especially when it comes to user satisfaction. Having over 600 titles on its library and some great live events, the website does definitely deserve a position among the best. That said, there still remains a lot of ground to be covered especially in terms of allowing lesser minimum cashouts, after all, the majority of the online casino players rely on the small to medium range stakes and would thus prefer quick withdrawals. If you are interested in trying out online casinos, then this EUcasino review should give you a good indication as to just how great the site is.